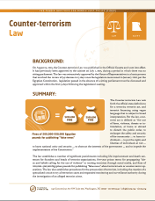 Background: On August 15, 2015, the Counter-terrorism Law was published in the Official Gazette and went into effect. It had previously been approved by the cabinet on July 1, 2015, during a period in which there was no sitting parliament. The law was retroactively approved by the House of Representatives in a hasty process that involved the review of 341 decrees in 15 days once the legislature reconvened in January 2016; per the Egyptian Constitution, legislation passed in the absence of a sitting parliament must be discussed and approved within the first 15 days following the legislature’s seating. 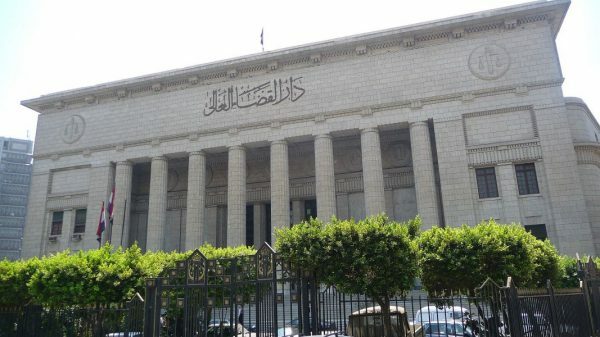 The law establishes a number of significant punishments including life imprisonment and death sentences for founders and heads of terrorist organizations, five-year prison terms for propagating “ideas and beliefs calling for the use of violence” or inciting terrorism through social media, and fines of 200,000–500,000 Egyptian pounds for publishing “false news” about terrorist acts or counter-terror operations. The law also establishes procedures for the prosecution of terrorism, including the creation of a specialized circuit to try all terrorism cases and expanded monitoring and surveillance authority during the investigation of an alleged terrorist crime. Implications: By writing into law a broad definition for terrorism and creating new prosecutorial and judicial mechanisms, the Counter-terrorism Law expands the scope of acts that can be tried as terrorism; subjects even nonviolent, constitutionally protected actions of everyday citizens, journalists, and rights defenders to possible prosecution under terrorism legislation; and contributes to a culture in which national security concerns automatically trump human rights and legal obligations. a number of substantively relevant national security laws, including, but not limited to, the amendment enabling military trials for attacks on public facilities. Adherence to Legal Norms: The international legal community recognizes the right of every nation to take effective counter-terrorism measures. While there is no definition for terrorism that is agreed upon internationally, broad and vague definitions have been found to violate international law. The United Nations General Assembly has affirmed that states “must ensure that any measure taken to combat terrorism complies with their obligations under international law;” that any restrictions on derogable rights, such as freedom of assembly and expression, adhere to a strict set of guidelines; and that non-derogable rights, such as the rights to life and freedom from torture, cruel, or inhuman or degrading treatment, be respected under all circumstances. When implemented in a broad manner, the Counter-terrorism Law is very likely to implicate a number of rights, including but not limited to the rights to life, expression, assembly, privacy, due process, and freedom from torture, cruel, or inhuman or degrading treatment, thus raising questions on the country’s constitutional, regional, and international legal obligations. On a procedural level, because the Counter-terrorism Law was ratified in the absence of a parliament and hastily approved without discussion when parliament was ultimately seated, the manner via which it was passed very likely violates Article 156 of the Egyptian Constitution. In April 2017, rights lawyer Mohamed Ramadan was sentenced in absentia over his personal Facebook posts to 10 years in prison on charges of insulting the president, misusing social media, and inciting violence per the Counter-terrorism Law; he was also sentenced to an additional five-year house arrest and a ban on the use of social media for the same length of time. Ramadan’s appeal is currently on hold pending an ongoing constitutional challenge to the Counter-terrorism Law. In October 2017, university student and leftist party member Andrew Nasif was sentenced to five years under the Counter-terrorism Law for reportedly promoting the commission of terrorist crimes on social media, making him the first Christian sentenced under the Counter-terrorism Law; in May 2018, Nasif was among those pardoned by Sisi. In addition to these two prominent sentences, there are a number of ongoing cases, including the Wilayat Sinai case, in which defendants face possible charges under the Counter-terrorism Law. Text of the Law: A full text of the law is available here in Arabic. An unofficial translation of the law is available here in English.